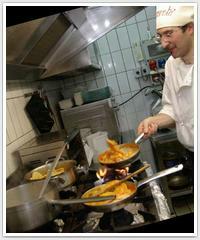 Would you like to cook just like an Italian chef? Are dreaming of cooking the fantastic dishes typical of the Mediteranian cuisine you sampled on your holiday? Thanks to the Old Taverna Sorrentina Cooking School these wonderful dishes won't hold any secrets for you. Chef Guglielmo Gargiulo offers different courses in his kitchen (situated the heart of the historical center of Sorrento) to enable you to learn how to cook like a real Italian chef and give you the opportunity not only of trying the dishes that make Italian cuisine unique and loved all over the world, but also of learning the secrets of recreating these dishes in your own home anytime you wish. Would you like to cook just like an Italian chef? Are dreaming of cooking the fantastic dishes typical of the Mediteranian cuisine you sampled on your holiday? Thanks to the Old Taverna Sorrentina Cooking School these wonderful dishes won't hold any secrets for you. Chef Guglielmo Gargiulo offers different courses in his kitchen (situated the heart of the historical center of Sorrento) to enable you to learn how to cook like a real Italian chef and give you the opportunity not only of trying the dishes that make Italian cuisine unique and loved all over the world, but also of learning the secrets of recreating these dishes in your own home anytime you wish. It doesn't matter if you prefer to make cakes, cook lasagne or just follow a tasting class, the cooking school of Old Taverna Sorrentina is the ideal place for you.